You've probably seen her before. In the grocery store. At Mass. At the park. Her hair and clothes may be a tad disheveled, but what's really distressing is her tone of voice. You can tell she's frustrated with her kid - that cute little bundle at her side. You can hear the tension in the tone of her voice, and see the child's frustration escalating, too. It's awkward to see her, and - for better or worse - when most of us see her we think to ourselves, "Thank goodness I'm not like that!" Well, today that was me. I went grocery shopping with the toddler in tow, and we made it through our first stop with flying colors. I was really patting myself on the back. I've got this! Then, we went to our second stop, and it was one of those grocery stores with the little carts. You know - the carts that kids dream about at night and parents dread. Normally, we're not in a huge rush and if it's just the two of us, I am totally fine with moving through the store at a snail's pace while she pushes her tiny cart through the aisles. But not today. I was running a tad behind schedule, and I really needed to run in and run out and get back to pick Therese up from school. Bless her heart, but a strong sense of timeliness is not one of Maria's strong suits. I felt bad, but I was definitely rushing her. When we finally made it to the self check-out line, she insisted on helping. She clutched the cereal box and refused to let go until I had to pry it out of her hands. She leaned on the bagging area (which, of course, can trigger the "please wait for assistance" screen, so we try to avoid that). And then she started wandering off with her cart?! I'm not sure what was going on, but I think she thought she was being helpful. In her defense, most of the times that she's making life a tad more challenging she truly is trying to be helpful. At any rate, I was on the verge of totally snapping with her, and got pretty darn frustrated. It was embarrassing, and I could just imagine everyone looking at me and thinking, "That lady has no idea what she's doing. Why can't she control her kid???" 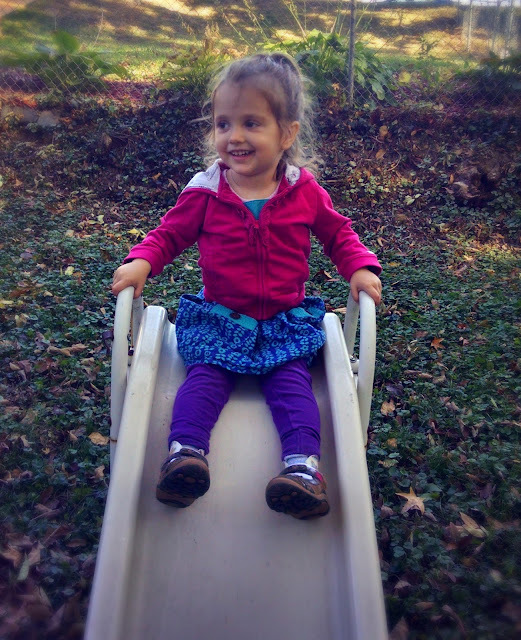 Actually, now that I'm writing this, I'm finding huge comfort in thinking of a recent post by Nell, in which her three year old gave HER a dose of humility. I am convinced that God gave me the vocation to motherhood in order to make me humble. If I had been called to religious life, I really think that I would have gone on thinking myself fully capable. But every single day of motherhood I realize - I am not capable. I desperately need God's grace to get through the day. One of my favorite parts of St. Therese's Story of a Soul, is when she enters religious life and instantly is humbled by her lack of ability in terms of housekeeping. She literally has no idea what she's doing, and it takes her a long time to learn how to properly clean, do laundry, etc. All of these tasks were ones that, given her social status, she wouldn't have otherwise had to have learned. It's amazing but true - God has a way of helping us grow in holiness through our vocations. And often, the ways he stretches us are little ways. Through a tiny child, through an inability to clean the choir stalls in your cloistered Carmelite monastery. Each little moment can become a reminder that we aren't perfect, and that we need God. I hate feeling the way I felt today...but I'm grateful that God can use even my frustrations for growth in some area of my life. I've got a long way to go, but He's given me two adorable teachers to nudge me on the right path.